The genesis of this hat pattern is pretty straightforward: I had yarn leftover from the Crossed Furrows Cowl. It used three colours, but one of them had more of a supporting role and the third really only had a cameo. I started wondering how to use up that leftover yarn and how to do the plaid stitch in the round, and suddenly I knew what to do with the leftovers. I would make a hat. Except that it wasn’t just one hat. I started wondering some more, and a two-colour version also sprang into being. And then a tester wondered about turning it into a slouchy hat, and suddenly two hats became four! 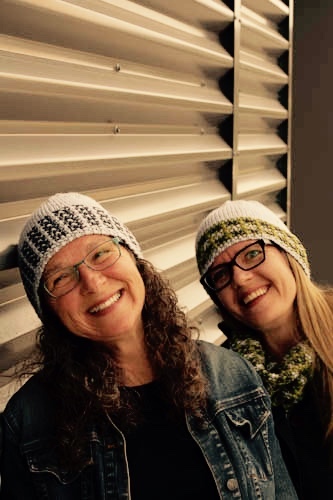 Presenting the Crossed Furrows Hat to use up the leftovers of the cowl, or any aran yarn you desire. Sized from Baby to Adult Large. Use the code ‘staywarm’ at checkout to get 25% off until Sept 7. I’ve also made a little bundle of the two matching patterns – you get both for $6.50 rather than $8. It’s automatic, so if you’ve already purchased the cowl, you’ll get the discount too – and this deal doesn’t expire! On a personal note, I was pretty excited to convince my mom to model with me! We had a great time, and it made it a real family affair. Dad had taken the original photo of the crossed furrows, Mom was modelling with me, and my daughter Sandra was behind the camera for the photo shoot. She helped us stay very serious and focused. 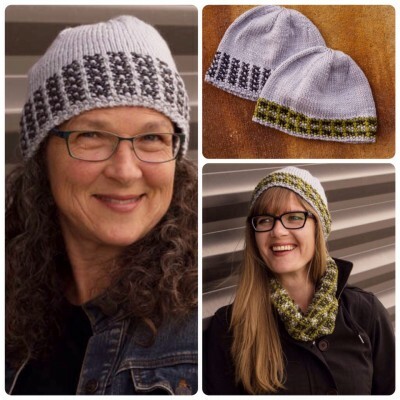 Crossed Furrows (nearly) has two matching hats! 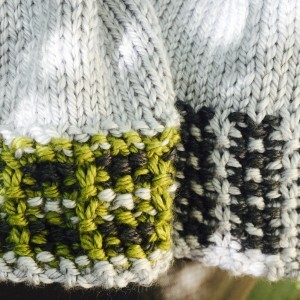 About to be released…two, yes two, hat patterns to use up the leftovers from the Crossed Furrows Cowl pattern! There’s a two colour version and a three colour version. The sizes go from baby to large adult. 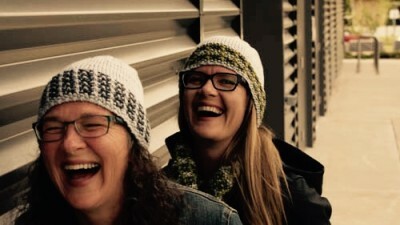 I convinced my mom to help me model the hats, but as you can see, we couldn’t stay serious the whole time. 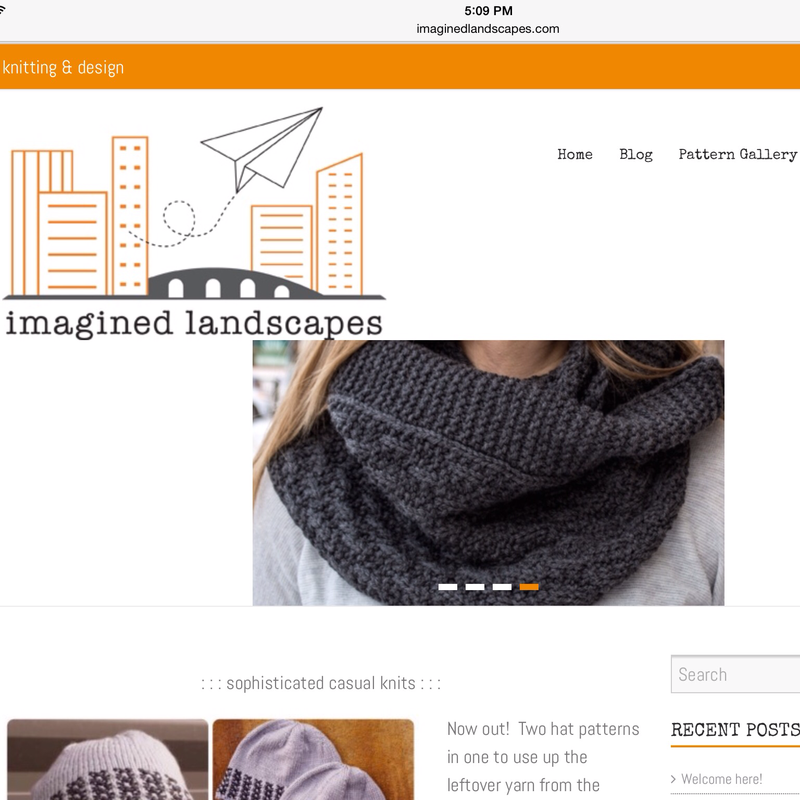 I’ve got designs for sale on Ravelry, and now I’ve got a matching Instagram and Twitter place to hang out with you! Come follow me @Imagined_Landscapes at Instagram. And Twitter’s names are shorter, so pop on over to follow @ImaginedLand. Things continue to be really busy behind the scenes here. But moving out from behind the curtains are two new places to find me. There will be knitting, designs to share, and contests. 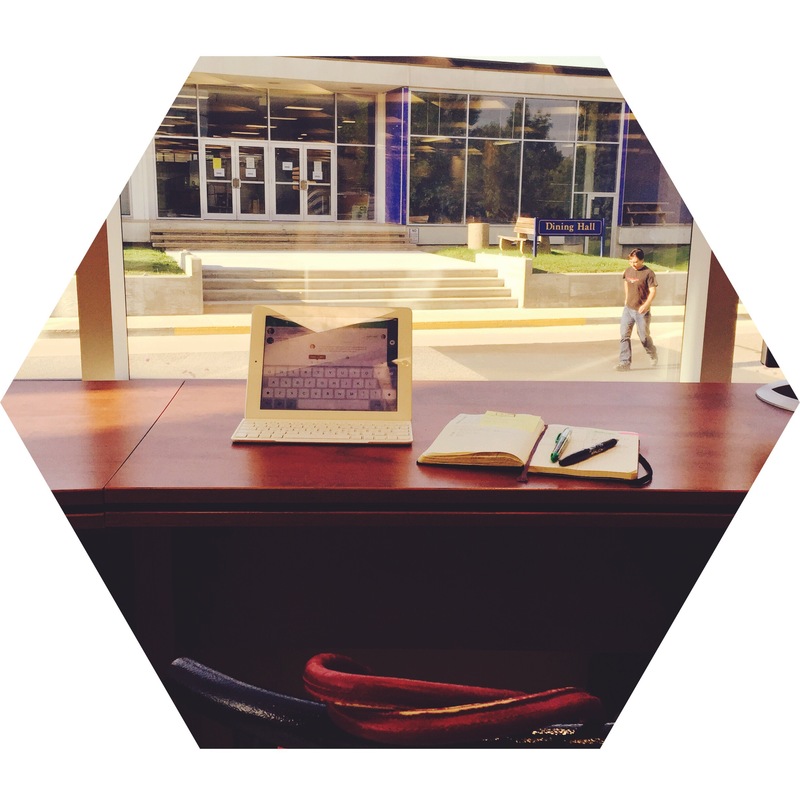 First I did a little writing in the library. Nothing like a huge, rounded window in front of you to keep stodgy thoughts away. Then Rainer’s bullet journal took my bullet journal out for coffee. 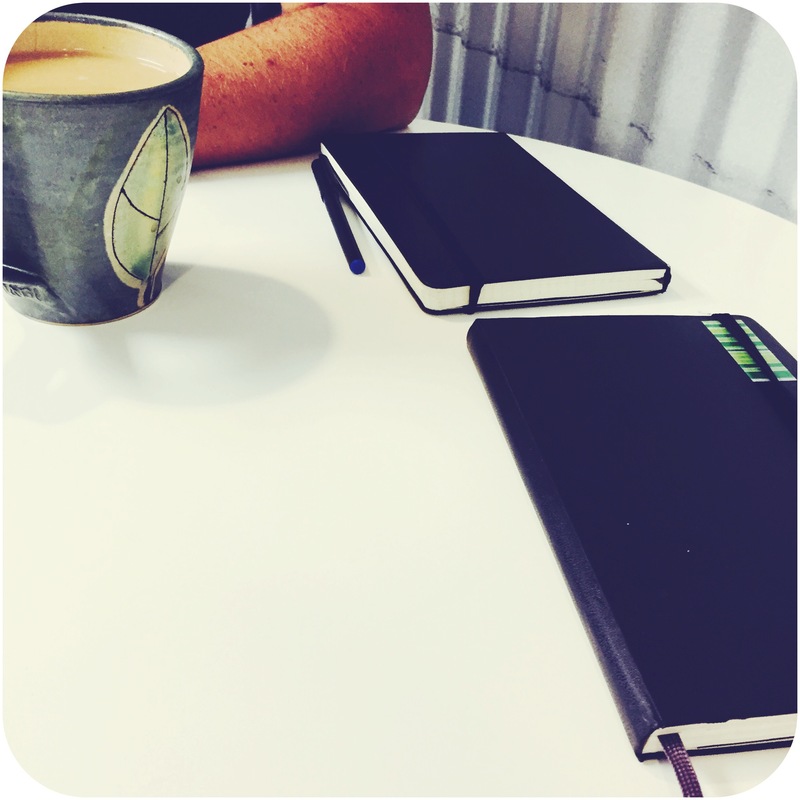 Seriously, we need to find a place that sells different cover options for our Moleskines! 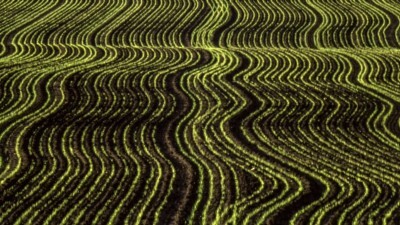 We use the ones with grid lines.